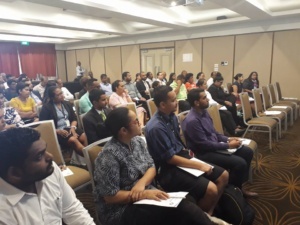 More than 100 practicing lawyers and bankers enhanced their knowledge and understanding on the interaction between theory and practice in legal and banking issues in a one-day workshop hosted by the Fiji Institute of Bankers (FIB). FIB Executive Secretary Eta Bilitaki said the objective of the workshop is to enhance the understanding of participants of the topics and their applications in the practical commercial world. 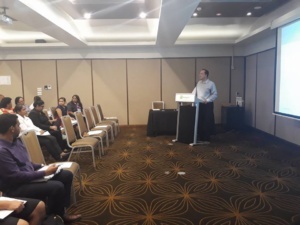 “The workshop was held at the Holiday Inn whereby participants looked at banking services approaches to the customer and dispute resolutions,” said Bilitaki. This workshop helped participants understand about the new Personal Property Securities Act No. 45 of 2017 and its applications while also learning about Listing and Investing in the Stock Market from the South Pacific Stock Exchange CEO. “We invited lawyers and bankers to participate in this one-day workshop which featured a presentation from Chief Justice Anthony H.C.T Gates and other invited guest speakers,” she added. CEO of Capital Insurance Ian Faragher also addressed participants giving them a glimpse on Insurance and the Big Picture while CEO of Fiji Revenue and Customs Service shared the implementation of the VAT Monitoring System. The workshop also awarded 10 CLE points for practicing lawyers. Bilitaki said participants were engaged in discussions and asked questions to all the facilitators. The workshop was part of the activities that FIB organized for this year targeting its members from its Affiliated Banks.